Sweet Pear MInt - Mentha 'sweet pear' Interesting Hybrid mint variety from the Westerfield collection. Attractive variety has elongated soft silver-green leaves. Scent and flavor is said by some to be similar to ripe pears. Good for culinary or tea use. Tall, upright and vigorous growth habit. Richter's exclusive. Perennial zones 5-9. Live starter plant in 3 inch container. I'm a huge fan of herbs. I love to plant them & use them in cooking/drinks. 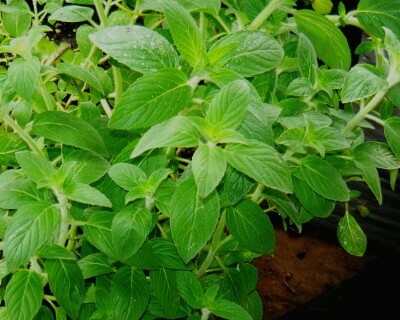 As with all the CCF herbs I've bought, the quality of this plant is wonderful. It's growing well and looks lush and healthy. I don't get a "sweet pear" smell or taste from it, though. Not sure if I will end up using it in recipes, but it's definitely pretty to look at. I have just made a purchase of over 25 different herbs from this nursery including this Sweet Pear Mint. I buy herbs from many Nursery's Colonial Creek is the best ever. Every herb arrived in perfect shape well established and very healthy and a great size ready to transplant and take off growing. Love these people, plants obviously were grown and cared for with a lot of TLC. I normally would not take the time to comment on every plant purchased but this Nursery deserves it. And the price is a true bargain for the quality. I Highly recommend this grower. Smells vaguely of fruit. Tastes weird and is rather gross; wouldn‘t recommend for culinary use. Grows great the Same year it was big and strong, but seems to not come back strong after Winter. Looks alright. Slightly hairy leaves.